Once you have an understanding of Block bookings, follow this guide to learn how to set them up in ResRequest. To set up a Block booking, follow these simple instructions. Go to Reservations menu > Block Templates. (If the Block Templates option is greyed out, contact your system administrator to extend your user access to this module). To start the setup of the new Block Booking, click on the ‘New Record’ icon on the toolbar. This opens the ‘Create new block template’ screen. The yellow asterisk indicates if certain information is mandatory for the Block Booking setup.You are now building the base information for this Block Booking. This is where you will name the block and reference the agent, add commission, contact, reference number and any notes, if required.Once all the information has been captured, click on the “Save” icon on the toolbar. The Block Template – also known as the Block header, has now been set up and it’s time to start building the Block Itinerary. Start building the itinerary by clicking on ‘Add Period’. A pop-up will appear where you can select the frequency that the itinerary will be repeated. This could be weekly, monthly, or at specific intervals. This is where you determine how long the Block Booking should run for, how often the itinerary will occur, and how much lead time is required before the block expires. An expiry date can also be selected for which the itinerary will no longer be valid.Once the dates are selected, click ‘Go’. Click on the ‘Save’ icon on your toolbar. The yellow highlight will disappear once it has been saved and you can now start building the rest of the itinerary for the Block Booking. Click on this drop-down on the right hand side to view your options. At this stage, you can select one of 3 options. 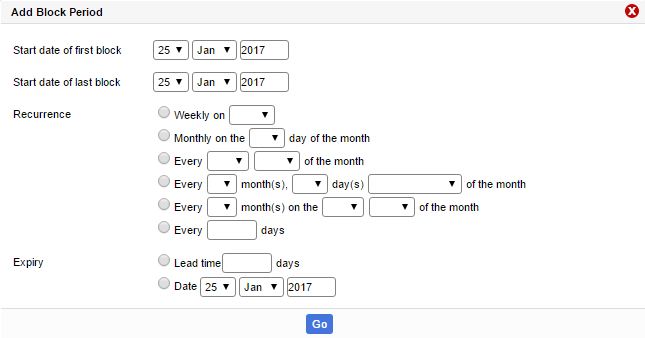 Edit: to make changes to the period you’ve just set up. Add Itinerary: to continue building the itinerary for your Block Booking. Delete: delete everything you’ve created on this Block Booking up to this point.To continue building the Block Booking, click on ‘Add Itinerary’. To continue building the Block Booking, click on ‘Add Itinerary’. A line will appear where the first itinerary line can be inserted. This is where you define what the first property is, what currency will be charged, how many nights, pax and rooms will be allocated. The ‘Start’ and ‘End’ column refer to the days of the itinerary. For example, if you selected ‘Every Monday’ as the period occurrence, the start day here will be day one, i.e Monday. So, in the example below, we have inserted ‘Start’ as 1 and ‘End’ as 5, meaning that the itinerary will commence at the selected property on the Monday (day 1) and end on day 5 which would be Friday. When you have completed the Start, End, Nights, Rooms and Pax amount, click on Accept ✓. The yellow highlight indicates that this itinerary item needs to be saved before continuing. Click on the ‘Save’ icon in your toolbar. Once saved, you will notice that there are now two drop-down arrows appearing on the right. The top one can be used to add additional itinerary items. The drop-down on the newly created itinerary item can be used to edit, or delete the single itinerary item. Once building your itinerary has been completed, you can generate the allocations for the agent. To do this, click on the top drop-down arrow and select ‘Generate Allocations’. A pop up will appear to warn you of overbookings. You will be requested to either Continue or Skip any items that will cause overbookings. You will then notice that the Block Template Details at the top of the screen will indicate how many allocations have been set up for this Block Booking. In this case, 13 Allocation itineraries are linked to this template, 3 of which have already expired. These details will also indicate if you now have any overbookings because of the Block Booking you’ve just created. You can click on the number in the ‘Overbookings’ section to see which part of your Block Booking has caused the overbooking. 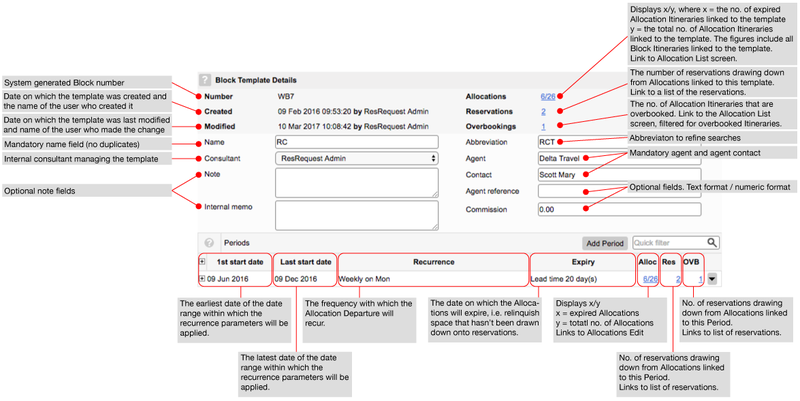 Allocation can be viewed in the same way, by clicking on the number next to ‘Allocations’. If a Block booking allocation is deleted from the Agent contact record, the block will be deleted too.